An example of a graphic that will be displayed throughout campus to encourage students to plan ahead for Spring 2019 class registration. 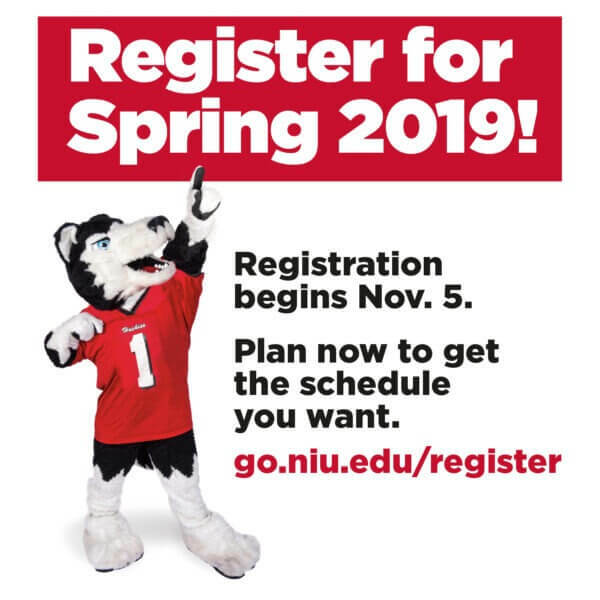 Students will encounter extra reminders and resources this month encouraging them to sign up for spring 2019 classes at Northern Illinois University. NIU is leveraging a new go.niu.edu/register webpage, social media, postcards, emails, mobile messaging, and print and digital signage across campus to inform students enrollment starts the week of Nov. 5. Did you know you can contribute to this effort as a staff or faculty member? According to Renique Kersh, associate vice provost for Student Engagement and Success, a little encouragement to a student you know personally can make all the difference. You can learn registration dates and find a list of advisors and other resources on the registration landing page. Encourage students to meet with their academic advisors in October. Contact Renique Kersh at rkersh@niu.edu to request registration flyers for your workspace. Share information with students about the Huskie Installment Plan, which divides semester expenses into four equal payments. Encourage students with financial concerns to speak with someone in the Financial Aid and Scholarship Office or the Office of the Bursar. Direct students to the resources that can help them resolve any holds on their account. Download this registration PowerPoint slide and display it at the beginning of classes. Students who register early have a better chance of getting into the classes they need, and because they are enrolled, they are more likely to qualify for scholarships and other financial aid.